My First Bilingual Book - Colours (Urdu & English) will help children to learn their colours in both Urdu and English. This sturdy board-book features a two-page spread per colour, with a large image on the right and four smaller images on the left, each showing objects in that colour. Below each image is the word for the object in both English and Urdu in large, bold text. 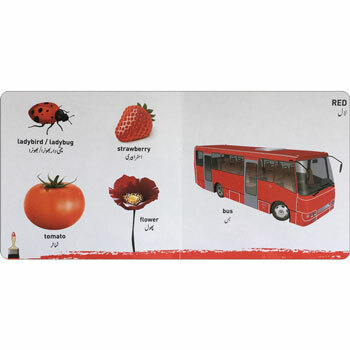 Children can explore different colours while they learn the words for objects around them in two languages. 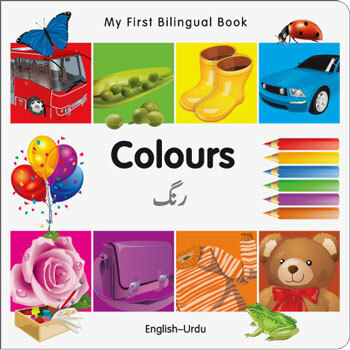 My First Bilingual Book - Colours (Urdu & English) is ideal for children learning either Urdu or English. Please note that there is no pronunciation guide included so it would be useful for an Urdu speaker to use this with a young child to help them to say the Urdu words.